Current Position: Elfira Sidharta is the owner of Magic Touch Cleaners in Tempe, Arizona. 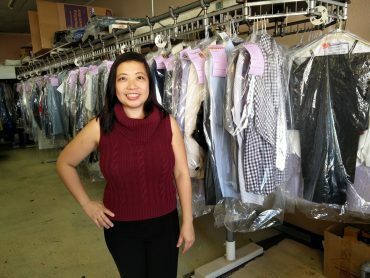 “My store is best described as a small mom and pop dry cleaner,” Sidharta said of her establishment that mostly serves young professionals and students. The Early Years: Sidharta was born and raised in Yogyakarta, Indonesia. Yogyakarta was the capital of Indonesia before relinquishing that designation to Jakarta. “My city is now more known as a center for culture and the arts,” Sidharta said. Crossing the Pacific: When she was 21, Sidharta’s family moved to the United States and settled in the Southern California area. She enrolled at California State Polytechnic University, Pomona and earned a Bachelor of Science in Chemical Engineering. Pre-Dry Cleaning: After finishing college, Sidharta worked various jobs. She did inside sales for a chemical company and dabbled in the restaurant industry. She eventually landed at Neutrogena Corporation in Inglewood, California. She held multiple positions over a three year period for Neutrogena, the most recent being Project Manager for Product Validation. A New Opportunity: As her contract was expiring, Sidharta faced the decision to sign another agreement and continue with Neutrogena or try her hand at something new. It turns out that Sidharta was ready for a new challenge. A friend who moved to Arizona told her of a dry cleaner that was for sale. “I flew from L.A. to Arizona to visit the store and said to myself that this is something I could do,” Sidharta said of the idea to venture into the previously unchartered territory of fabric care. An Attitude of Gratitude: Devout in her Christian faith, Sidharta is careful to reflect any personal glory and accolades to God. “I feel like He is the One who makes everything possible for me,” said a grateful Sidharta. “I give a lot of credit to my mechanic who provided services and let me pay whenever I had the money, especially in the early years of my business,” she said. Sidharta also networks and partners with friends she has made in the dry cleaning industry. Having their support to lean on and advice to follow during tough times has been an invaluable resource. She is especially thankful for her personal friends, who on short notice, had selflessly given of their time to assist in the store when Magic Touch was short on labor. Personal: Sidharta, 35, is single and lives in Chandler, Arizona. Although Sidharta spends the majority of her time in The Grand Canyon State, she stays connected to her roots in the Southern California area with periodic visits to her father and siblings.